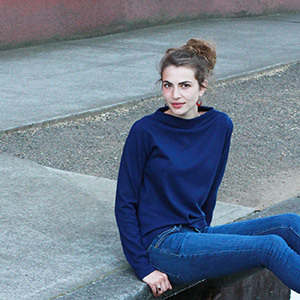 Toaster Sweater #2 is an easy top or sweater designed to keep you toasty warm and stylish in the cooler months. If sewn in the right fabric, it is versatile enough to be worn in the spring and early summer. 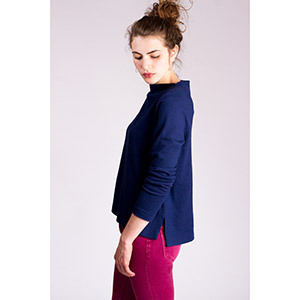 It is somewhat fitted through the shoulders and sleeves and is loose through the underarms and hem. 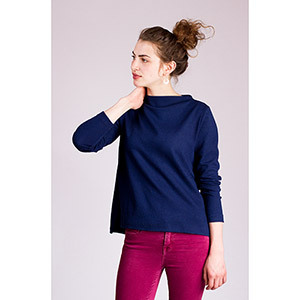 It features a semi-high-neck that takes its inspiration from funnel and boat necks. It also has side vents with a hi-low hem that is 1” shorter in the front than the back. The front hem falls just below the high hip. Sew it in a boiled wool knit, a wool jersey or ponte for a more dressed up look. Sew it in a sweatshirt fleece (with stretch) or jersey knit for a more casual look. It is very simple to sew and perfect for sewists of all levels. 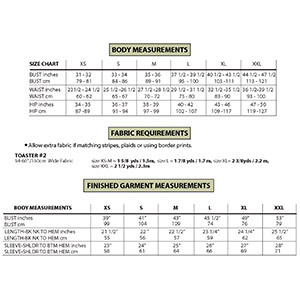 Suggested fabrics are cotton jersey, sweatshirt fleece, cotton lycra, french terry, ponte de roma, or hacci sweater.